Mandla – Mandla is located at a distance of 35 kms. Mandla fort is quite famous among the tourists, with a view of water flowing along the Rangrez ghat and Rapta ghat through narrow streams, which give way to Limestone, Magnesium and Basalt rocks. You can visit the ruins of Mandla fort – a 17th century fortress, surrounded by beautiful temples and architectures. 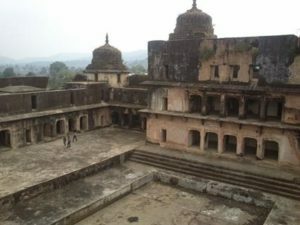 Ramnagar Fort – Ramnagar fort is at a distance of approx 60 kms from Kanha National Park, built in the 17th century, along with the banks of Narmada river. Among one of the forts here, is the Moti Mahal – a three-story fort that was built by the Gond kings. Explore the ruins of Ramnagar on this half-day excursion. Tribal Village – You can spend one of your evenings visiting the Tribal village, witnessing their lifestyle and tribal dance. You will have to drive for 30 mins to reach the Tribal village from the Resort. 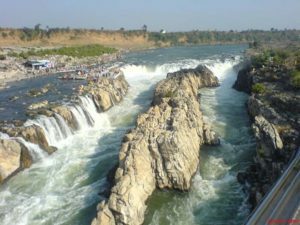 Jabalpur – Situated near the Narmada river, Jabalpur is a small town which is famous for its tourist attractions such as Marble rocks, Dhuandhar falls, the Lord Shiva temple. Jabalpur is located at a distance of 130 kms from Kanha, and can be done as a full day itinerary as well. Medicinal plantation – Medicinal Plantation Conservation Area or MPCA is located at a small village, Boda Chhapri 4 kms from the Resort and is worth a visit. But do remember to ask for a naturalist with good knowledge of plants and do not go on your own as this place is well inside dense forest and has visiting hours.